The iconic Alberta Legislature Building is a large granite, sandstone, steel and glass structure with a massive dome. It’s surrounded by 57 acres (23 hectares) of immaculate parklands. Join a free tour to see its marble and carved wood interiors and painted portraits. After learning about Alberta’s political history, take the children outside to spot squirrels and rabbits. The whole family can wade in the reflecting pool in summer and skate on the ice in winter. The classic Alberta Legislature Building was built between 1907 and 1912, after Alberta became a Canadian province in 1905. To fully appreciate its interior, start at the rotunda on the second floor of the building. Admire the large solid Canadian marble pillars, which weigh 16 tons (14.5 tonnes) each. Listen to the echoing fountain in the center of the rotunda. It was built to commemorate the first official visit of Queen Elizabeth II, as the Head of the Commonwealth. The Regimental Colours circling the rotunda represent Alberta’s military units. Read the memorial plaques for lost soldiers and see portraits of historically significant local leaders. Don’t miss the statue of the province’s namesake, Princess Louise Caroline Alberta, and the one of Chief Crowfoot, an important Native American leader. Make your way up the Grand Staircase to the Legislature Library. It’s still in use by the Members of Assembly, but remains open to the public and displays interesting relics, including a preserved hamburger from 1969. Stop by the door to the Legislative Assembly Chamber to see the intricate carving of the Alberta Coat of Arms. Some people come to the stately Legislature Building just to enjoy the surrounding parklands. Relax around the reflecting pools, see if you can spot the local wildlife and take photos of the colorful natural displays. The Legislature Building near Victoria Park is a five-minute drive from downtown, or 10-15 minutes by public transport. It’s open daily, except Christmas Day, New Year’s Day and Good Friday. Entry is free and complimentary English and French tours run throughout the day, lasting about 45 minutes. Trying out an Edmonton Legislative Lights Tour will help make the visit to this famed attraction even more memorable! For more things to do, have a look at our Edmonton things to do page. This multi-million dollar music hall, located in the heart of downtown Edmonton, has a world-renowned acoustic design and is home to the Edmonton Symphony Orchestra. This open-air museum tells the stories of agricultural settlers from Eastern Europe who came to the region over a century ago in search of free land. Stop for a refreshing brew and observe the process of making beer at this popular family-owned micro-brewery in the heart of Alberta. Experience what the Jurassic period would have been like in this prehistoric preserve filled with gigantic, moving and roaring dinosaur models. Enjoy scenic walks, cycling, picnics, snowshoeing, cross-country skiing, bird watching or canoeing at North America’s longest continuous stretch of urban parkland. 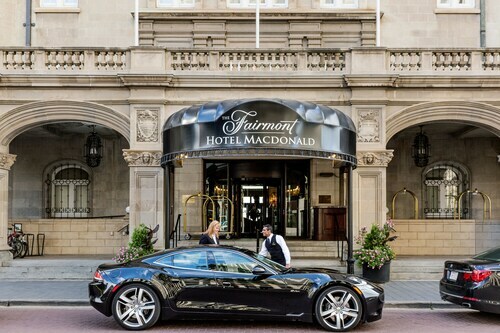 This hotel is centrally located in Downtown Edmonton. It is 2 blocks from the Legislative Assembly, 6 blocks from the Art Gallery of Alberta, and 1.5 km from the Shaw Conference Centre. Matrix is 1.3 km from Rogers Place. In the heart of Edmonton's business and government districts, the hotel is surrounded by shopping and restaurants; the world's largest shopping center, the West Edmonton Mall is 12 km (7 mi) away. On the North Saskatchewan River and a landmark in the city since 1915, this Edmonton hotel offer spectacular river valley views, 1 block from the Shaw Conference Centre and 2 blocks from the Art District and City Hall. Rogers Arena is also within a 10-minute walk in the Ice District. 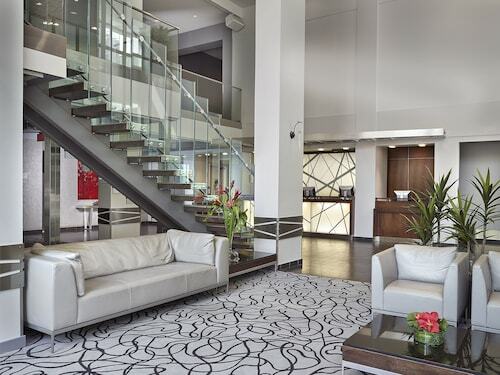 Located in Downtown Edmonton, this eco-friendly hotel is within a 10-minute walk of Shaw Conference Centre and Citadel Theatre. Winspear Centre and Art Gallery of Alberta are also within 15 minutes. Central Station is only a 4-minute walk and Bay-Enterprise Square Station is 7 minutes. 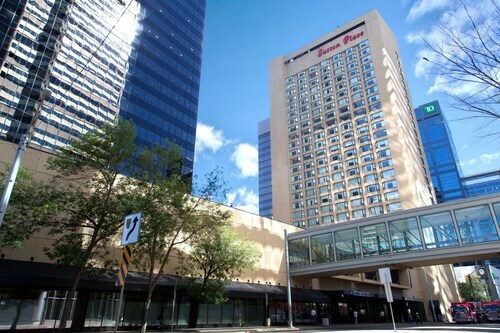 Located in Downtown Edmonton, this hotel is within a 15-minute walk of Alberta Legislature Building and Rogers Place. Shaw Conference Centre and Edmonton City Centre are also within 1 mi (2 km). Corona Station and Bay-Enterprise Square Station are within a 5-minute walk. 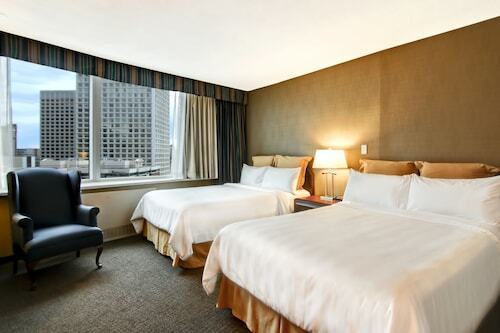 Located in Downtown Edmonton, this hotel is within a 10-minute walk of Shaw Conference Centre and Edmonton City Centre. Rogers Place and Royal Alexandra Hospital are also within 2 mi (3 km). Central Station is only a 4-minute walk and Bay-Enterprise Square Station is 11 minutes. Located in Downtown Edmonton, this hotel is within a 15-minute walk of River Valley Funicular, Rogers Place, and Shaw Conference Centre. Edmonton City Centre and Royal Alexandra Hospital are also within 2 mi (3 km). Bay-Enterprise Square Station is only a 4-minute walk and Corona Station is 7 minutes.